About two years ago I saw some stools designed by Japanese studio Torafu Architects at the SCP furniture showroom in London, I liked their clunky simplicity. I subsequently learned that they were produced in collaboration with the Ishinomaki Laboratory, a community workshop which developed in the Miyagi prefecture, a region devastated by the tsunami triggered by the earthquake in March 2011. The Laboratory started as a shared common utility, for locals to reconstruct their lives with timber, materials, labour from volunteers, and expertise from designers. After urgent repairs, the laboratory expanded into running design workshops, providing training, and skill sharing. They developed some artefacts for others, including around 40 benches which were used for outdoor film screenings, then stools, tables, chairs, and bookshelves, all with more than an echo of Enzo Mari's autoprogettazione project from 1974. Herman Miller, a global furniture manufacturer joined the assistance program at the Laboratory to help promote and distribute the artefacts. That's how I saw them at the SCP showroom. When asked to contribute to What Happens to Us, I was reminded that sociologist/philosopher Bruno Latour has suggested that for communities to assemble - at whatever their scale - they need a 'matter of concern' or a 'controversy', a 'trial' or an 'issue' to convene around and make them visible. While this might be true, I also feel there is something missing form Latour's provocation. Something about the ability to facilitate or host the collective, something more like an 'infrastructure', something as simple as a place, a text, electricity, furniture, a feeling of security, or a cup-of-tea. Which is not to suggest the infrastructure pre-dates the community, but something like an excess, a generosity or a potential is necessary in some of the actors to enable an assembly, reassembly and account. 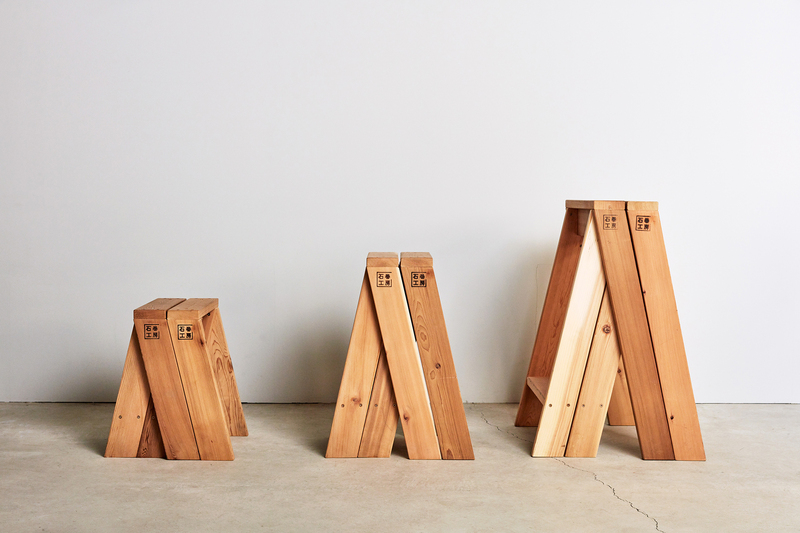 So I though it would be interesting to try and produce something like an infrastructure for the various communities that were imagined to be called into action, during the month of What Happens to Us, and I remembered the Ishinomaki Laboratory stools. They would help groups congregate, and provide a resource for the project, a community asset. 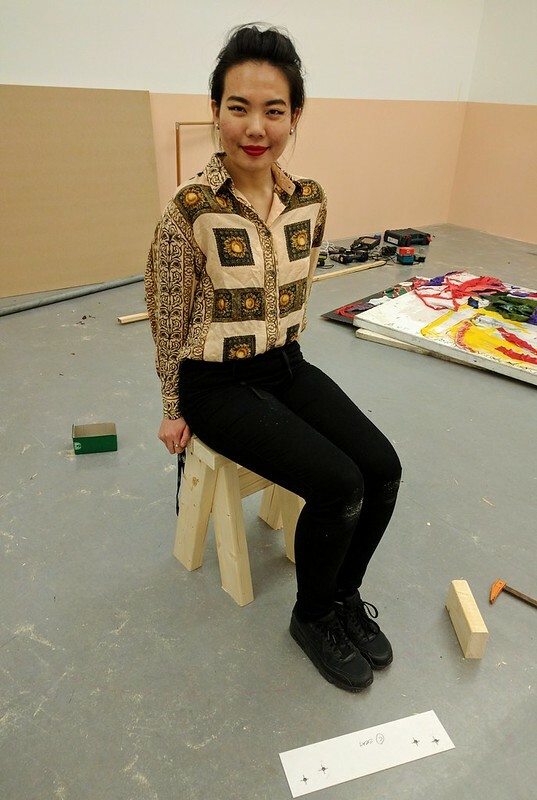 And of course, I though it would be necessary that the stools were made cooperatively by those participating, and that 'infrastructure' would itself, even temporarily, become the matter of concern before again slipping from attention. The AA Stool is simple, made of standard 2×4 timber, the legs are cut at a slightly angle and that provides support for the seat. The thing is, I made a prototype and found the narrow seat uncomfortable, and the unbraced legs, wobbly. 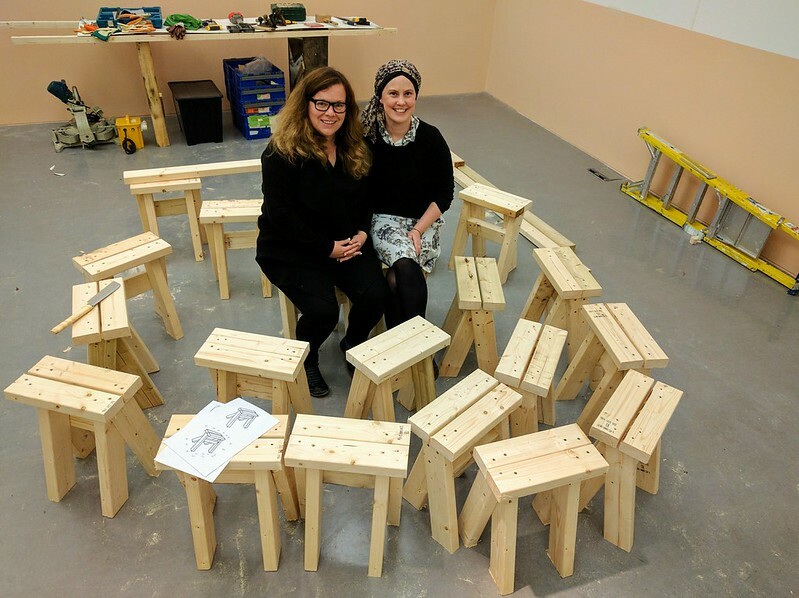 The curators, Amy and Marsha thought they could easily make use of 30 stools. So, I hacked the stool design. I added a cross-brace for the legs, and a second seat component, it was more stable, slightly more generous and I thought, more accommodating. The good thing is all the parts could be sawn from a standard 3 meter length, with only a tiny sliver of 'waste'. They also interlocked quite nicely, good for storage, and maybe for assembling into longer benches. I made some simple drawings, cut cardboard templates for the three components - with screw holes pre-marked - bought a box of 70mm self-tapping screws, and packed some hand tools into a bag. At What Happens to Us , people assembled for the workshop. I explained my intention that we would collectively make some infrastructure, to make some stools to enable others to assemble. I showed the drawings, explained the use of the templates and the technique and joy of cutting with Japanese saws. 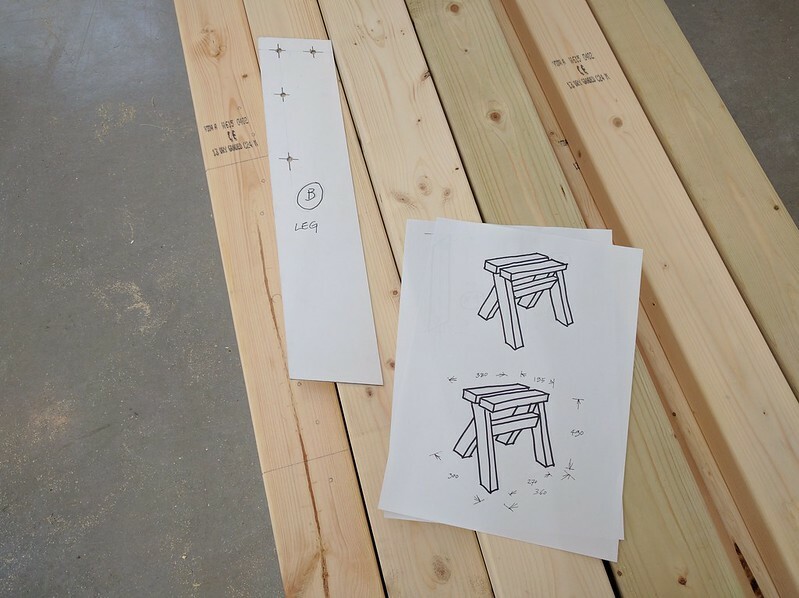 So, we individually marked out the necessary components for a stool on the purchased timber, and congregated in teams to start sawing and assembling. Skills were swapped; the soft, long, slow, concentrated pull stoke of the saws encouraged. Trickier was the communication of how to produce the forceful drive of electric screwdriver bits to countersink the screws, a technique very difficult to explain, but easier to feel. It's something like a knack that could be experienced, acquired through repetition - as thought learned in a bodily way - and then deployed. Generally, the more experienced nurtured the less. 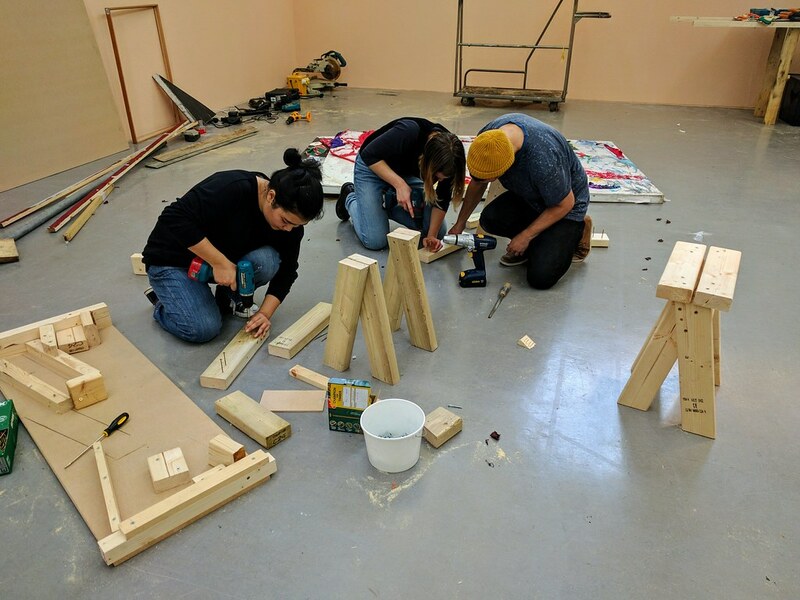 Groups formed to figure out how to assemble the cut components, and we decided collectively that we needed a jig to facilitate the 'handed' A-frame leg assembly. A jig was made, and some packing-guides cut. 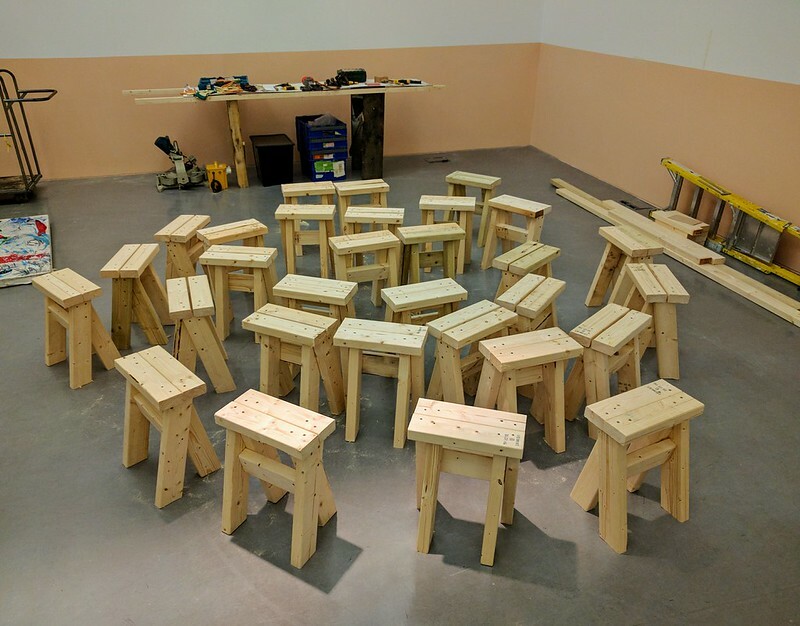 We each assembled our first stool, a slight glow of pride was followed by an intoxicating buzz of excitement. This was fun, and it was productive. Simple protocols, both material and inter-personal, political even, emerged, were modified and put back to work. These protocols – like putting packing-guides between the A-frame legs to assist in clamping and screwing the seat components – revealed and enabled a means of accounting for the moments of creative cooperation. The moments when two or more people have to negotiate - rather than merely comply with instructions, coordinate their actions and work together to produce something for others, something that others could benefit from, something like a community. Like Latour, I suspect there is no such thing as a 'community', or 'democracy', only processes that produce communities and governance: democracy is not what governs us, rather, it's what we produce, or not, when we chooses to assemble together. Its produced at every exchange, every moment of cooperation, assistance, administration, and leadership. Democracy is not imposed upon us from elsewhere, its what we do to each other. The stools and their production were like machines for producing temporary, democratic communities; self governing communities. We self-organised into small clusters, some groups marking out and sawing, others simply sawing, others assembling. People moved fluidly between the clusters, contributing where necessary. New people turned up, and could be quickly inducted into the process, learn the simple skills and contribute. During lunch we discussed the need to accelerate production - we'd produced almost 10, and needed 20 more - Karem volunteered to pre-cut some components in the college workshop, on a chop-saw. This is what happened, some legs and seats were pre-cut, and clusters concentrated on assembly. In no time, we had thirty stools produced more or less democratically.